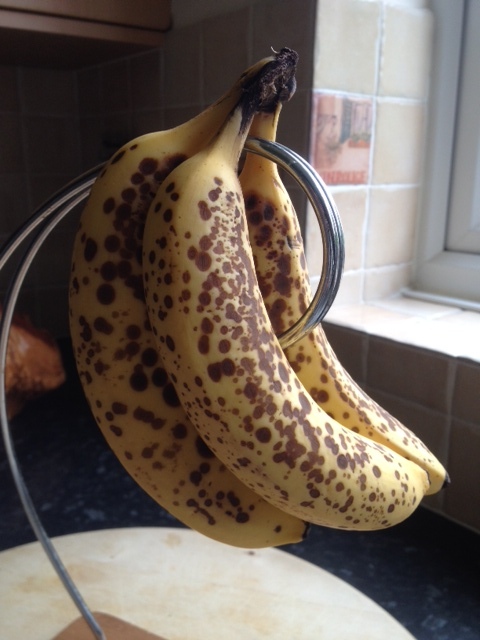 Many a dieter has told me ‘Oh I don’t eat bananas, they’re fattening’ To which I’ve learnt to not choke in reply but ask incredulously, why do you think that? Look, if you have some weight to lose, don’t tell me you’re afraid of a banana when you’ve clearly been at the cakes, biscuits, sweets, chocolates, crisps, chips, pizza, burgers n ice cream. You get the picture. Banana’s or any of our great natures foods and fruits are the most nutritious and balanced foods we can eat. Yes even that great carb horror the humble potato is a good source of vitamin B6, vitamin C, copper, potassium, manganese, and dietary fibre. It’s what we do with them that adds the fat factor unfortunately. Anyhoo back to bananas. I always recommend eating bananas for good health. The natural sugars that are in a banana can change the nutritional content substantially as it ripens, this is what I ask my clients to be aware of. Not that scary is it? Low fat, plenty of fibre and good carbs for your days energy. I recommend that you eat bananas when they are perfectly yellow, when they are just ripe, firm and not too sweet. Never eat a banana when it is still green as it contains indigestible starches and less easily digestible sugars, which means you will bloat. When your banana is as ripe as this, the calorie content doesn’t change but it will contain more sugar. It’s starch (complex carbs) changes to simple sugars as it ripens and will cause a higher spike in your blood sugar levels after you eat it. You can freeze over ripe bananas or use them as healthy milkshakes blended up with milk for the kids. Completely no artificial ingredients added and much better than any Nesquik. Anti-aging properties. Bananas carry vitamins A, B6, C, E, F, iodine, potassium, magnesium, zinc, and iron. These gems will keep your skin looking young. Marvelous for your kidneys and bones thanks again to potassium. The potassium restrains calcium excretion in your urine – minimizing the risk of nasty kidney stones. Say goodbye to osteoporosis! Bananas keeps you from losing calcium from you body. Bananas can help with depression. Bananas contain Tryptophan which produces serotonin in your body, which will calm your brain and make you relaxed and help sleep. They’ll help keep you regular. Your colon will love you because of the fibre. Suffer from gout? Arthritis? Bananas contain B6, folate and vitamin C – all enemies of gout and arthritis. Too much alcohol Saturday night? Put that coffee down and grab a banana. It’ll raise your blood sugar levels and re-hydrate your body. Too stressed out? Potassium sends oxygen to the brain and normalises your heartbeat. It won’t take your problems away, but it’ll make them more tolerable. Bananas contain prebiotic, which help stimulate the growth and activity of pre-existing good bacteria in your digestive system. Your gut wins! Still don’t want a banana? I usually have mine in the morning, chopped up over some Weetabix or All Bran. How will you have yours?